In response to the evolving nature of residency training, the Division of Urologic Surgery has recently initiated a technology-centered educational curriculum. 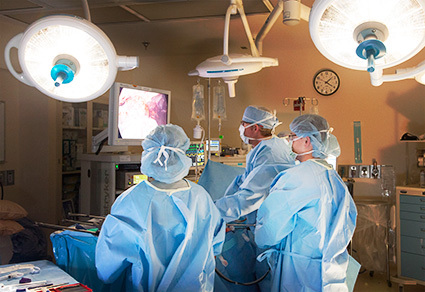 The field of urology is heavily focused on advanced imaging and surgical techniques including complex extirpative and reconstructive laparoscopy and robotics. Indeed, the vast majority of index operative procedures performed by urologyresidents at UTMCK are accomplished laparoscopically or with use of the daVinci® robotic operataing platform. This department is fortunate to have two daVinci® robotic operating platforms, one of which includes a dual console and trainer. This operative paradigm shift has not only required urology faculty to modify and modernize aspects of their operative instruction, but has also engendered a change in the mindset of resident education in general. Nowhere is this transition more apparent than with the implementation of the new American Urological Association Core Curriculum. This online, dynamic teaching tool essentially offers residents and practicing urologists the opportunity to pull educational information from established textbooks, guidelines panels, etc., through a centralized web interface. Certainly, the era of hard-backed textbooks and operative observation suites is becoming obsolete at the hands of these online educational resources, digitalized surgical instruction, and virtual reality based simulation. To this end, the division purchases iPads for all urology residents as well as a new 27 inch iMac for the urology resident office. Ultimately, all salient education materials including the AUA Core Curriculum and ACGME required documentation (duty work hours, New Innovations resident and faculty surveys, Core Competency Requirements, and case log entry) will be run through the iMac server and thereafter to and from the resident iPads. Laparoscopic and robotic surgeries performed at UTMC, the Cleveland Clinic, and other nationally recognized centers of excellence will be centrally stored on the aforementioned server in an unedited, digitalized format. Residents will have the opportunity to download these videos to their iPads for home instruction and step-by-step review. Journal Club articles, didactics, and landmark studies will likewise be digitally catalogued and distributed in a similar fashion. We anticipate that this fiscal investment will greatly improve the educational yield for the residents. The didactic program includes the core curriculum of lectures and discussions based on Campbell's Urology textbook; weekly Morbidity and Mortality Conference; monthly Journal Club; monthly Practice and Professionalism Conference where guest lecturers are invited to discuss topics relating to practice development and professionalism in a seminar format; and Surgery Grand Rounds in which faculty or visiting professors present updates of various topics of interest within and without the fields of surgery. The importance given to the didactic program by the faculty is evidenced by the fact that residents are excused from all activities except absolute emergencies to attend conferences. Residents and faculty meet collectively at 6:30am every Tuesday to discuss surgical complications. A review of the events leading to the complication is examined with particular emphasis on practice improvement. Residents and faculty discuss interesting cases acquired during the week as well as upcoming surgical cases. Radiographs are presented and residents are expected to answer questions regarding the case itself as well as the disease process and its management. This conference is held immediately following Morbidity and Mortality. One designated faculty member will meet with the residents each Tuesday morning at 8am to discuss one to two chapters from the Campbell's Urology textbook. 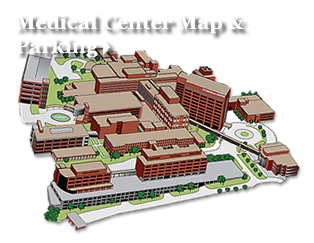 In general, residents will be expected to read the assigned chapter(s) and complete its accompanying Study Guide questions. Residents can expect to review the entire four volumes over the course of two years. Held in conjunction with the Department of Radiology, our residents and faculty attend this bi-monthly radiology conference devoted wholly to Genitourinary. The conference is held on Monday mornings at 7 a.m. The Multidisciplinary Tumor Board meets every Wednesday morning at 7am to discuss cases of interest as well as management dilemmas. Faculty from the Department of Surgery, Medical Oncology, Radiation Oncology, Urology, Pathology, and Radiology and Nuclear Medicine are in attendance. In addition, updates on ongoing clinical trials are discussed. A combined urology-pathology-radiology conference is held on the first Monday of each month at 7am. A particular disease process, usually malignant in origin, is chosen for each meeting. Patients seen in our urology clinics are discussed by us. The radiographs of these patients are discussed by radiology residents and attending radiologists. This conference offers an excellent educational experience with particular emphasis on continuity of patient care and a better understanding of the pathophysiology, diagnosis, treatment, and outcome of urologic diseases. Grand Rounds is held every Thursday at 7am. Current topics within and outside of the field of urology are discussed by invited internal and external faculty members. Understanding the increasing role that business and practice management plays on one's clinical success has led to this multidimensional conference that meets approximately every six weeks at 5pm. This conference brings in lawyers, financial planners, ethics professors, and the like to speak on topics relevant to one's future as a practitioner. An invited speaker serves annually as the Albert W. Biggs Visiting Professor. Dr. Biggs was the first chief of the Division of Urology at UTGSM and a key advocate in implementing resident education at the University of Tennessee as a whole. Invited Professors are generally nationally recognized authorities and significant contributors to the field of urology. The professorship focuses on a full day of resident education as well as the A.W. Biggs' Lecture and Grand Rounds for the Department of Surgery. The faculty recognizes the importance of scholarly research in contributing to the expansion of the greater good, and are available at all times for assistance. Accordingly, strong relationships have been forged between the division and several academic departments at the University of Tennessee Graduate School of Medicine. Ongoing research includes industry-sponsored clinical trials, animal lab research conducted at the University of Tennessee School of Veterinary Medicine, collaborative prospective and retrospective studies with the Department of Radiology and Radiation Oncology, as well as ongoing research under the guidance of the UT Cancer Institute at several Oak Ridge National Laboratories in Oak Ridge, TN. As stated, basic science laboratories are available through the Department of Surgical Research with PhD support. Animal lab facilities are available both at UTMCK as well as at the School of Veterinary Medicine. Residents are encouraged, but not required to, complete research during their training.